Deals can't be just about the money. Two advisors with experience say make the focus a new culture and better talent. Some turnover is to be expected in a merger, but there are ways to minimize it. Dollars often drive the decision behind a merger or acquisition. It could be the promise of a larger share of wallet from existing clients, greater profitability from creating economies of scale or more fruitful succession planning. What often isn’t discussed, as merger veteran Greg Friedman of wealth management firm Private Ocean pointed out in a 2014 Wall Street Journal article, is the disruption. Your clients and staffers choose to work with you because they like your culture. 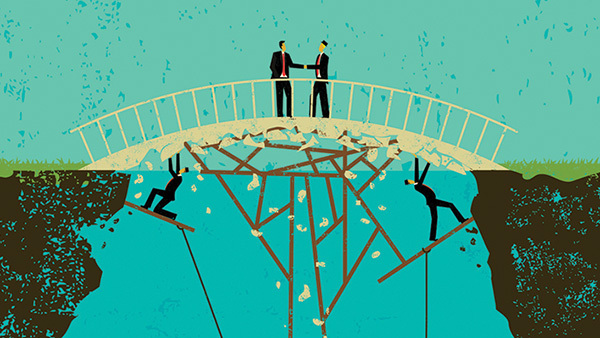 How can you keep from losing it—and them—in a merger? For some ideas, I interviewed Private Ocean’s Friedman and Brent Brodeski of multi-acquirer Savant Capital Management. “The definition of a culture,” Greg Friedman observed, “is what happens in a firm when nobody’s looking.” Friedman is president and CEO of Private Ocean, a $950 million independent RIA firm in San Rafael, California, formed by the 2009 merger of Friedman & Associates and Salient Wealth Management. Second, Savant wasn’t a bureaucracy. “As a Midwestern firm, we value hard work, we get our hands dirty, we’re very entrepreneurial and not flashy,” he said. This focused view of its culture has enabled the firm to be “very picky” in choosing its partners, Brodeski said. In his experience, those clients who do stay on board become quite loyal and remain for the duration. “Most clients appreciate being part of a larger firm that has succession figured out, offers more capabilities and has a deeper bench,” Brodeski said.